That's it up the top. Bump! Only 4 teams fans have posted so far! Updated squad with Roarie Deacon's change of number and Jean Alassane Mendy's signing. 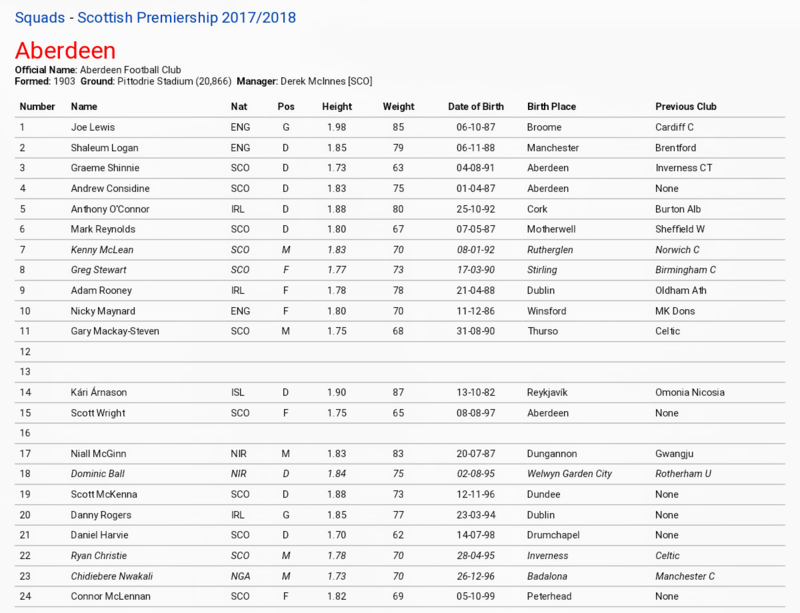 The Aberdeen list is up to date now with all squad numbers, ages and contract details. Updated to include our recent signings, and exclude VDW. The club's going through a really annoying spell of not announcing how long players have signed for. Updated with the news Jesse Curran has signed a new deal. St Mirren and Livi fans not adhering by the Premiership forum rules. Sooner they're down the better IMO. Our squad will be up when mostly complete. Dont count your chickens before the eggs are even laid. We are not the only team who has not put up a squad. If we get who Stubbs is trying to get in it will raise a few eye brows and ear to ear smiles from Saints fans. This after the world cup in particular when England are out That last bit is a quote from Alan Stubbs and no not a current England player. Francis Jeffers 3 year deal. Are you not a bit concerned at the lack of goalkeepers in your squad??? Are you not concerned with the lack of pegs in the changing rooms??? Updated list with Vincent, Waddell, Gourlay and Ferrie going out on loans. Updated the Livi list with the departure of Dylan Mackin and the signing of Ross Stewart. Updated Dundee's squad to reflect El Bahk leaving on loan to Dunfermline and Wolters going back to Holland and to update where several players have since joined. #19 Lewis FERGUSON (18) - SCO - 20?? Updated with the loan signing Egli Kaja. Aberdeen squad updated for additions of Cerny and Hoban and a note of Reynolds long term injury. Still need at least a first choice striker and a player to rotate with McGinn/GMS. I think McInnes is scratching around for a striker but the other player could easily be Hayes or (more likely) Christie.